This program came about after having several conversations with high-quality, strong, hard-working men. Strong. Courageous. Protective. Loyal. Generous. 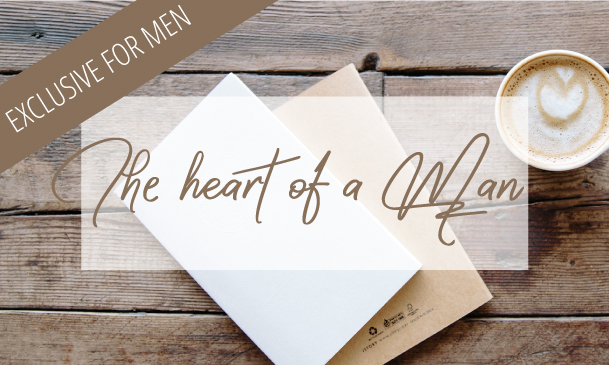 Enjoy reading inspiring stories below from some of my strong, courageous and committed male clients. I have also included an insider wife’s perspective on how her marriage and her life improved dramatically as a result of her husband working with me! Special note: I didn’t include my clients their personal information, however, they are happy to speak with you, personally. My life is forever changed! "I am a 45 year old male, a husband, a father of five children and a business owner. Before I started working with Jeanine, I thought my life was manageable. Now however, looking back, I couldn’t have been more delusional! In reality, I was spiraling downward, without noticing the profound negative impact it was having in all aspects of my life. I coped with life’s stresses for 20 years with alcohol and tobacco, and these substances had taken over my life! My motivation, my relationships and my family life were taking the brunt of my addictions and my life in all reality was unmanageable x10. Rock bottom was next, and it took the courage and love of my wife to confront me and offer what I now see as the most generous of ultimatums, “You need to give up alcohol and get therapy, otherwise, I will have to make a choice for myself and our children.” It was a wake-up call that I took offence to at the time, but that I desperately needed. Looking back, it was a pinnacle moment in my life that saved my marriage and my relationship with my family. I am truly grateful for my introduction to EFT and Jeanine. I immediately abstained from alcohol and put my trust in Jeanine. At first I was unsure about EFT and dreaded my appointments with Jeanine, however, it wasn’t long before I started to see the results. Without alcohol to cope, the fog began to clear and my eyes were opened. I became painfully aware of my circumstances and the pain I had caused my precious wife and the damage I had done to myself. Now, almost a year later, and numerous emotional EFT sessions with Jeanine, I have peeled back many layers of trauma that existed in my life that had led me to where I was. I then began to build a life committed towards becoming a superior man for myself, my wife and my children. Jeanine’s intuition and wisdom have taught me, and challenged me to take control. I even quit smoking after over 20 years! EFT was a crucial part in my success with overcoming my addictions. Jeanine is a God send, an angel sent to me and my family, and I am grateful for her every single day as I live this wonderful yet challenging new life. Through our sessions, Jeanine has taught me how to laugh, and that it’s ok for a man to cry. And most importantly, she has helped me clear the traumas that contributed to who I had become. Now I am learning to be the man that my family deserves, I am taking control!!! To all the men out there!!! We need EFT!!! Our lives as men can be trivial and unbalanced. Our responsibilities can be overwhelming. If you want to find long lasting peace and balance in your life, then trust in the freedom that EFT will bring. My life is forever changed. Thank you to my wife, thank you to Jeanine, and thank you for emotional freedom. I am a continuing work in progress :)"
A new life has opened up for me, one of peace, pride in myself and excitement for the future where I can realize my dreams! "Before I began my work with Jeanine I lived a lie. On the exterior I was a success in Business, a hard working executive, a confident and funny man. On the inside I was insecure, fearful of and expecting failure, angry, easily hurt and a workaholic. I did not feel proud to be a man and in fact loathed myself. I was in my third marriage, this time with who I consider my soulmate, and quickly heading to ruin. I day dreamed often of a righteous death performing some noble act that my loved ones would be proud of. I drank too much. I suffered with physical ailments. I was exhausted living a life where I felt unable to make anyone happy versus failing everyone. Jeanine saved my life. I have no better words than those. Through our work together she has helped me exorcise my childhood demons, flush years of guilt and self-loathing, help me relax and help me feel proud of who I am and proud to be the man I have always wanted to be. I trust Jeanine completely. She made it so easy to open my heart, my fears and my stories. The work is very hard but her gentle guiding soul allowed me to confront my past and bring me peace. Today, my relationship with my wife is on a great path. I have great relationships with my children. I feel great physically. I am more relaxed in life and business which brings me greater success in both. I like myself and feel proud to have survived well while under such internal stress and self-loathing. I made it to where I found my guiding angel, Jeanine, who has opened up a new life for me. One of peace, pride in myself and excitement for a future where I can realize dreams that had long been put aside." He’s excited about life and his motivation to take care of things has increased exponentially! "Before my husband started working with Jeanine, it was difficult for us to talk about “hot topics” without an explosion resulting. He was depressed, had no zest for life, minimal motivation, and little happiness. He was confused about a woman’s energy and took everything personally. When I was upset he always thought I was mad at him. Since working with Jeanine, my husband has most definitely grown and evolved!! He has learned how to listen to what I’m saying, and doesn’t take everything so personally anymore. As a result, he’s much more approachable. He’s excited about life, and his motivation to take care of things has increased exponentially! He has also quit smoking since working with Jeanine, and he had been a heavy smoker for many years. From a female perspective, working with Jeanine has been eye opening and absolutely amazing! I have learned so many wonderful things from Jeanine, including how to give a voice to my feelings and emotions, how to better balance my masculine and feminine traits, and how to best approach my husband so that we both get what we want and need! My life has improved dramatically. I have more self-confidence, I am much more calm and relaxed, I am less stressed, I am managing my time better, and I have learned how to take better care of myself. Self-care wasn’t something I made a priority in the past, and Jeanine has taught me the importance of self-care, and how to incorporate it into my life every day. For most of my adult life, I have suffered off and on from TMJ. It was at its worst when I started working with Jeanine one-on-one, and after only a few months of EFT my TMJ is gone! Our family life has also improved. We are a blended family with five children. Home life is very important to us and can be busy. It can be challenging making time for everyone, and working with the other parents. Since working with Jeanine I am much more balanced emotionally, and have more to give back to my family. I have taken the EFT training Levels 1, 2 and 3, and have learned how to use EFT with our children. EFT is a fabulous tool to use with children of all ages!! Jeanine is one incredible lady!! She has helped our family immensely. It is outstanding, in my opinion, what can be accomplished with EFT in such a short period of time. I know couples who have done years of conventional talk therapy with minimal results. EFT gives lasting, permanent results. Jeanine certainly has a special gift. I can’t recommend and compliment her enough. My and my husband’s lives have changed for the better since working with Jeanine." If you are a woman, feel free to forward this invitation to the special men in your life. A Precious Gift for Women who want to be Healthy, Happy and Free!